The session files are currently unavailable for this tutorial, sorry for any inconvenience. The guitars in the Session were playing through out the entire record; basically a 4 bar loop. Something that plays that much throughout a song can become pretty boring. You need to have a strong vocal and interesting melody to make sure that the listener wants to continue listening. But beyond that a little spice in the mix doesn’t hurt either, so that’s what I tried to do. The sound of the guitar is complete with 3 different parts – 2 are playing the same thing. The 2 identical guitars are carrying the chord progression for the song while the high pitched guitar is just there to add an interesting sound and vibe to the guitar group. With all 3 guitars together it sounds much better than when they play by themselves but the sound is still lacking something. They still seem to be a bit dull, there’s no real life to them. This track is meant to have a Pop vibe to it so these guitars need to speak a little bit more to the listener. 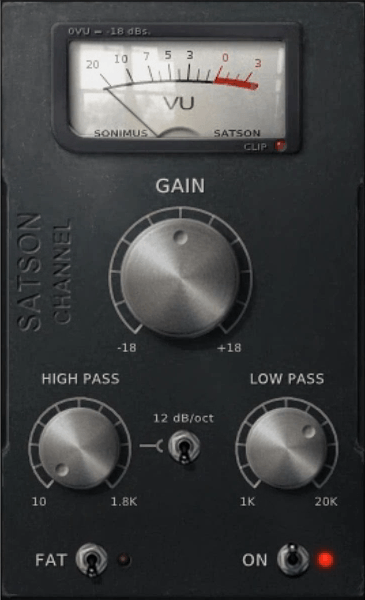 The first Plugin on this High guitar is the Sonimus Satson which is being used mainly for its slight amount of colour that it’s adding. The only setting that I’m using on this plugin is the Low Pass Filter. I turned it counter-clockwise until I could hear some of the prickly top end being removed. 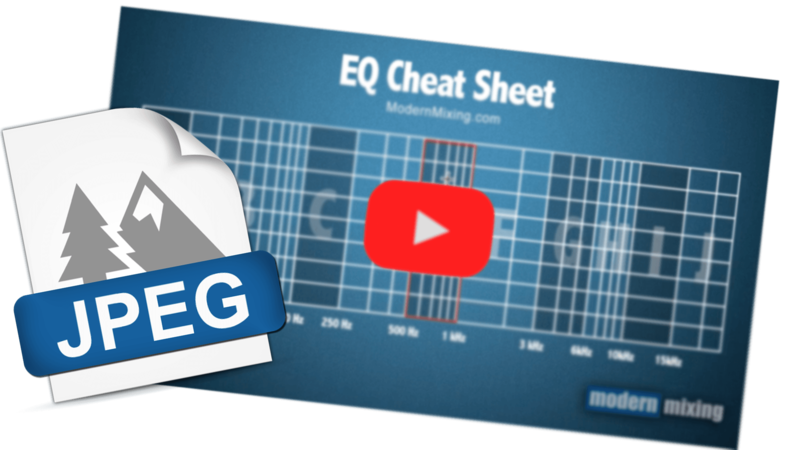 This dynamic EQ is being used to remove some of the 4k whenever it gets a bit irratating. 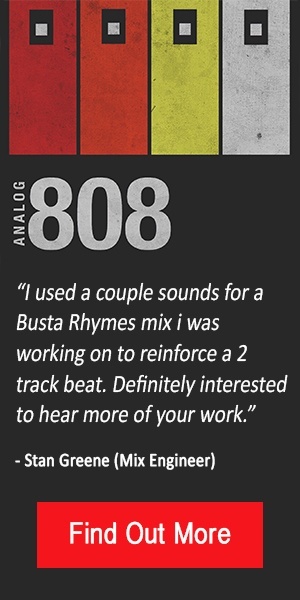 I could have reached for an EQ but I just liked the sound of this. 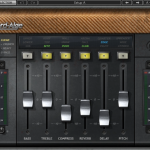 Another reason for using this plugin is so that I could get the tone to match a little bit closer to the other 2 guitars. This makes my life a whole lot easier so that when I send it to a bus I can get the exact tone I am looking for. 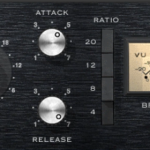 This is the one and only plugin that’s on this guitar. I’m using the Satson again, for the tone but also a bit of gain staging. 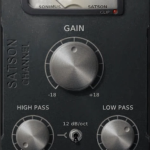 Sometimes when I use the clip gain for gain staging it doesn’t quite get the job done and the Satson has to be used to finish it off. Similar to GTR 1, I am using the Satson here for it;s colour but I am also taking advantage of the other tools built in. The gain I am using to boost the input as it wasn’t quite loud enough. The High Pass is being used to cut out some of the low end. Since both GTR 1 and GTR 2 are essentially playing the exact same thing this helped me separate the guitars a bit. Since these guitars were fairly prominate in the low end, I chose to let the left channel take all of the lows so that I could have a much better stereo image. All the guitars were routed to a Bus where more processing was done. Now that I have all the raw tones in the ball park of how I want it to sound, I can now manipulate them further as a group. 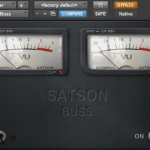 When I’m using the Satson in my mixing session, the buss is usually the first plugin that goes in my chain on a Group Bus. It helps complete that “analogue” chain that this plugin is meant to represent. 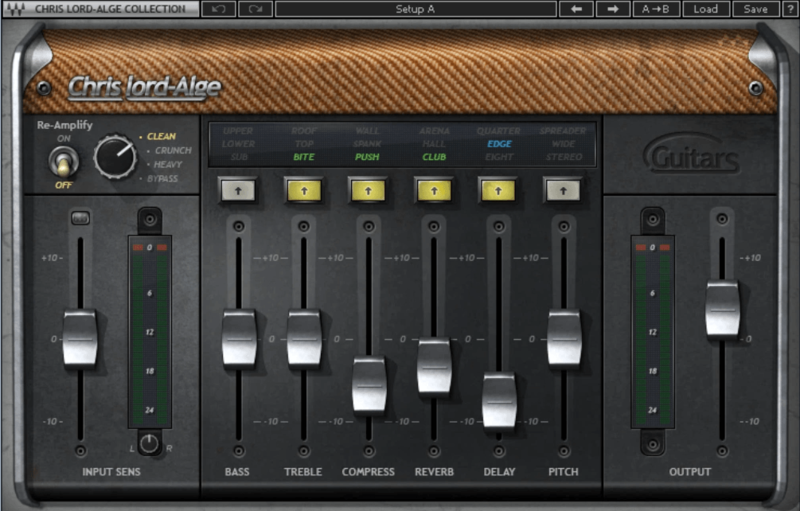 when it comes to acoustic guitar, I really love this plugin. It has everything I need to make appropriate decisions when mixing. Plus it makes me work really fast. 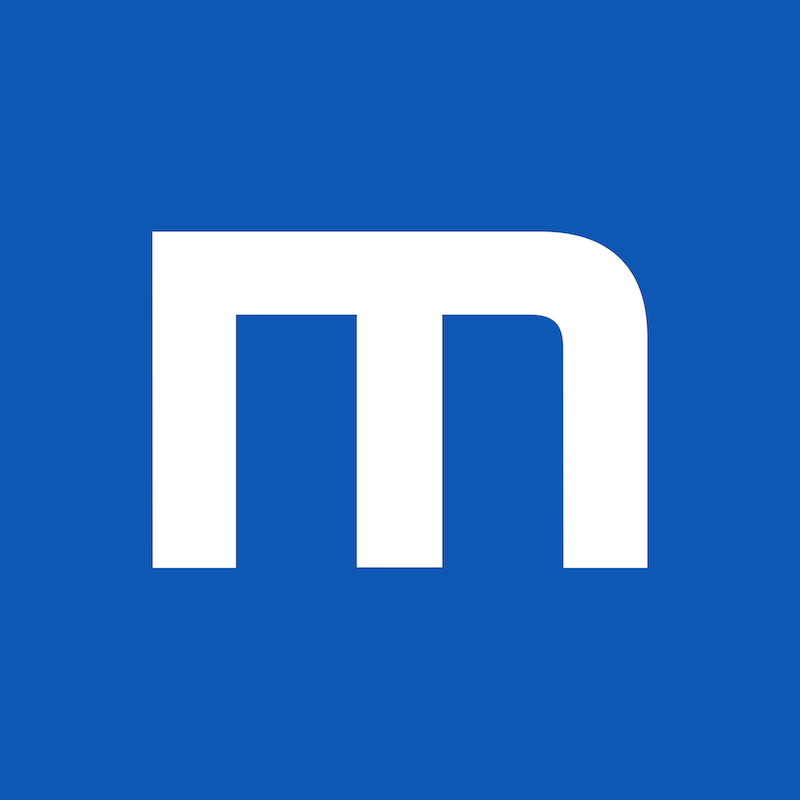 Treble (Bite) – I have this engaged because I wanted some mid range boost. 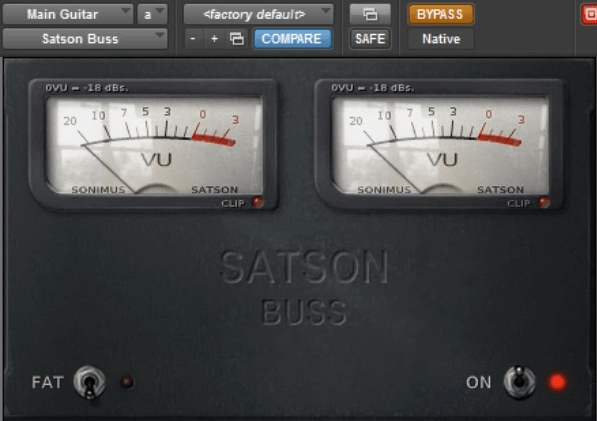 It’s just half way up which is stock for this plugin. 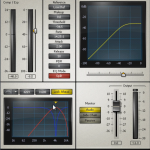 Compress (Push) – this is a form of parallel compression but it also sounds like its adding some mid-high end EQ to the sound. Since this fader is very sensitive I have it only about a 1/4 the way up. 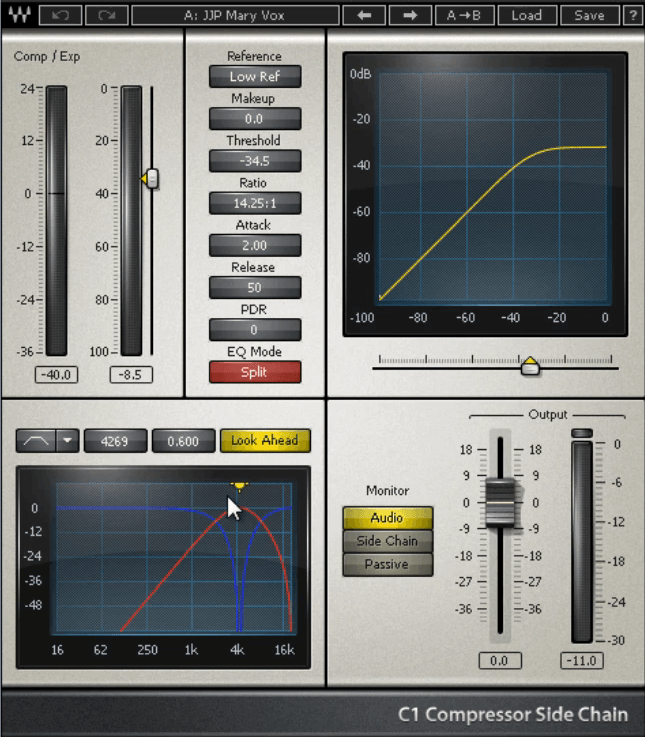 Reverb (Club) – this fader represent the reverb that’s built into the plugin. this one has the shortest decay of the 3 and since this song is more pop, I went with that option. To be honest, you could probably leave this one off and it would sound just fine. Delay (Edge) – This guitar sounded too stationary so the edge delay helped to give the guitar a little bounce which helped breath some life into it. There was something about the dynamics on these guitars that I didn’t like and this every compressor I tried just wasn’t cutting it. Then I pulled this plugin out and it helped to not only control some of the dynamics but it also gave it a rhythm that didn’t exist before. It worked really well when the vocals came in so I decided to keept it. So with a few steps were adding in some colour and giving the guitars more life. Even though every situation is different, maybe next time you are mixing a pop record you can take some ideas from me and use them in your session.